Tiotropium bromide is an anticholinergic drug, categorized as a long-acting muscarinic antagonist (LAMA) or long-acting anticholinergic bronchodilator.1 These drugs are used primarily in the management of chronic obstructive pulmonary disease (COPD), but interest in LAMA for the treatment of asthma has increased in recent years, particularly for patients whose asthma is poorly controlled with inhaled corticosteroids (ICS) and long-acting β2 agonists (LABA).1–4 Despite clear guidelines and a range of available treatments, at least 50% of asthma patients continue to experience poor control of their current symptoms or future exacerbations, which significantly compromises the patient’s quality of life and places considerable strain on health care systems.1,4 Thus, there is a need for additional therapeutic options. However, these RCTs involved highly selected patient populations (for example, nonsmokers with no serious comorbidities) managed in tightly controlled settings, in most cases with relatively small patient numbers and short study periods.2,9–13 Their broader applicability requires the support of clinical studies that better represent real-life populations and situations.14 Clinical studies on the effectiveness of LAMA as add-on therapy in real-life asthma care are still needed. To that end, we examined the clinical effects of add-on therapy with tiotropium in a diverse group of over 2,000 asthma patients treated in UK primary care practice. Study patients were at least 18 years of age and had a physician-recorded diagnosis of asthma; patients with a recorded diagnosis of COPD were excluded, but no other clinically relevant exclusions were applied. By comparing exacerbation rates and other measures of asthma control in the year before and after the addition of tiotropium to the patient’s asthma regimen, our goal was to determine whether the addition of LAMA improves asthma control in routine clinical practice. This historical, observational study of UK asthma patients used data obtained from the Optimum Patient Care Research Database (OPCRD; http://www.optimumpatientcare.org), which contains more than 5 million anonymized, longitudinal patient records from approximately 400 participating medical practices in the UK and is focused on patients with evidence of respiratory disease. The OPCRD has been approved by the Trent Multicentre Research Ethics Committee for use in clinical research, and the protocol for this study was approved by the Anonymised Data Ethics Protocols and Transparency Committee, which is the independent scientific advisory committee for the OPCRD. Data were examined for the period 2001–2013. The medical record of each study patient was examined for the 12 months before (baseline) and 12 months after (outcome) the date of the patient’s first prescription for tiotropium (index prescription date); hence, the index prescription dates spanned 2002–2012. Other LAMA drugs became available in the UK towards the end of the study period, but in the interest of investigating LAMA use in as many asthma patients as possible while using well-defined criteria, we limited the index prescription to tiotropium. Two formulations of tiotropium bromide for inhalation were available in the UK during the study period: a dry-powder inhaler with a recommended dosage of 10 μg (the dose delivered from one 18 μg capsule) once a day15 and a soft mist inhaler with a recommended dosage of 5 μg (two puffs of 2.5 μg) once a day.8 Although equivalence data are not yet available for patients with asthma, these formulations and dosages have comparable bronchodilator efficacy in patients with COPD,16,17 so we chose to study the patients as a group, regardless of formulation/dosage. The study patients had at least one prescription for tiotropium during the study window, had a recorded diagnosis of asthma, had no recorded diagnosis of COPD, were at least 18 years of age at the index prescription date, and had two continuous years of data (12 months each of baseline and outcome data). Figure 1 illustrates the patient selection process and study design. Figure 1 Patient selection process and study design. 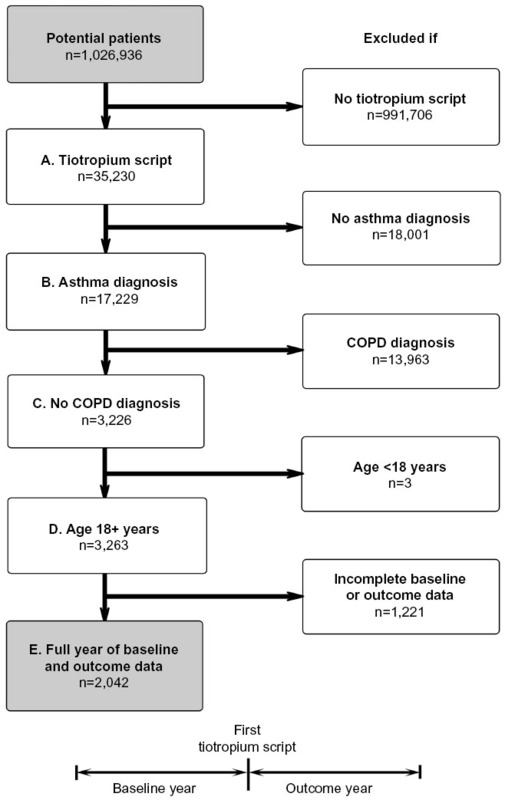 Inclusion criteria: (A) at least one prescription for tiotropium, (B) recorded diagnosis of asthma, (C) no recorded diagnosis of COPD, (D) at least 18 years of age at first tiotropium prescription, and (E) full 12 months of data before (baseline) and after (outcome) first tiotropium prescription. The baseline year was used for patient characterization and the outcome year for evaluation of asthma-related effectiveness measures. A complete list of the baseline variables examined is provided in the Supplementary materials (Table S1), along with their definitions and methods of calculation. The effectiveness measures compared before and after addition of tiotropium are described in Table 1. The two primary outcomes were exacerbations and acute respiratory events. We used the American Thoracic Society and European Respiratory Society definition of an exacerbation (asthma-related urgent hospital attendance/admission or acute course of systemic corticosteroids),18 although we limited systemic corticosteroid use to an acute course of oral corticosteroids (OCS) accompanied by a lower respiratory consultation (physician visit coded as asthma, COPD, lower respiratory tract infection, or lung function/asthma monitoring, with further respiratory examination, thoracic radiographs, or referral). An acute respiratory event was defined as either an exacerbation or an antibiotic prescription accompanied by a lower respiratory consultation (which was taken to indicate that the physician treated the episode as a lower respiratory tract infection). 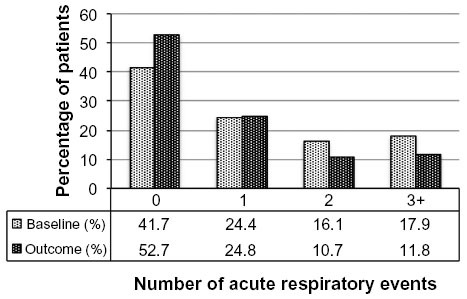 Multiple qualifying events within a 2-week window were counted as a single exacerbation or acute respiratory event. Notes: aAny lower respiratory consultation (asthma, COPD, or LRT infection code, or lung function/asthma monitoring) with additional respiratory examinations, including chest X-rays and referrals; bwhen paired baseline and outcome data were available. Abbreviations: A&E, Accident and Emergency Department; COPD, chronic obstructive pulmonary disease; LRT, lower respiratory tract; OCS, oral corticosteroid; SABA, short-acting β2 agonist. Secondary measures included the risk domain of asthma control (a proxy measure of asthma control as it pertains to exacerbation risk), specific components of the primary effectiveness measures (asthma-related acute OCS and antibiotic use), peak expiratory flow (PEF), forced expiratory volume in one second (FEV1), the ratio of FEV1 to forced vital capacity (FVC), and SABA usage. 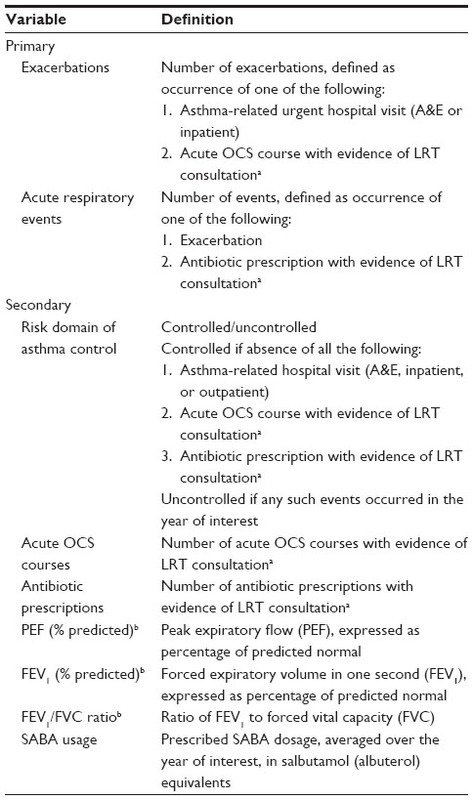 Asthma control in the risk domain was achieved if there were no episodes of asthma-related hospital, OCS, or antibiotic usage in the year of interest. 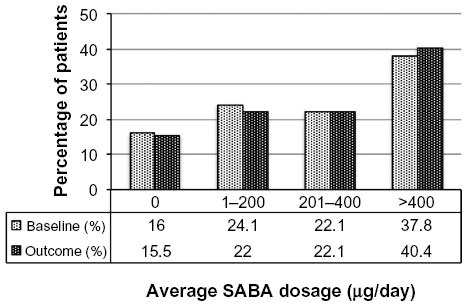 As the measure of SABA usage, the prescribed SABA dosage was averaged over the year of interest, with all SABA dosages converted to salbutamol (albuterol) equivalents (Table S1). The statistical analysis was conducted using Statistical Package for the Social Sciences version 21 software (IBM Corporation, Armonk, NY, USA) and Microsoft Excel 2007 (Microsoft Corporation, Redmond, WA, USA). Statistical significance was defined as P<0.05. Mean values are presented with their standard deviations and median values with their interquartile ranges (25th and 75th percentiles). Where data were not normally distributed, median (interquartile range) values are reported. Summary statistics were generated for all baseline and outcome variables. 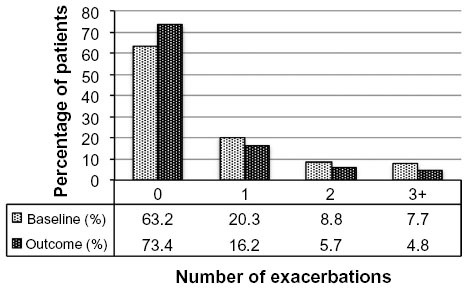 The number of exacerbations in the year before and after initiating tiotropium was then compared using the Wilcoxon signed-rank test for exacerbation counts measured on the interval scale and the marginal homogeneity test for categorized exacerbation data. These tests were also used to compare baseline and outcome years for acute respiratory events, acute OCS courses, antibiotic prescriptions, and SABA usage. The paired t-test was used to compare baseline and outcome years for PEF and FEV1, and the marginal homogeneity test was used for comparison of categorized FEV1/FVC ratios. The proportion of patients achieving asthma control in the risk domain was compared between baseline and outcome years using the McNemar test. Although the selection process deliberately excluded asthma patients who also had a recorded diagnosis of COPD, some patients with undiagnosed or unrecorded COPD may have been included, given the average age of the study patients and the prevalence of current or former smokers. For this reason, the primary analyses (exacerbations and acute respiratory events) were repeated for a subset of patients who were unlikely to have COPD based on the following criteria: ≤40 years of age, >40 years of age but never smoked, and >40 years of age with no evidence of airway obstruction (baseline FEV1/FVC ratio ≥0.7). A total of 2,042 patients met the study criteria. The dry powder formulation of tiotropium was prescribed in 1,898 patients (93%) and the soft mist inhaler in 144 patients (7%). Key baseline patient characteristics are summarized in Tables 2 and 3; complete baseline data are provided in the Supplementary materials (Tables S2–S6). The mean age was 63 years; 59% of patients were female; the mean body mass index was 29 kg/m2; and of those whose smoking history was known, 54% were either current (17%) or former (37%) smokers. 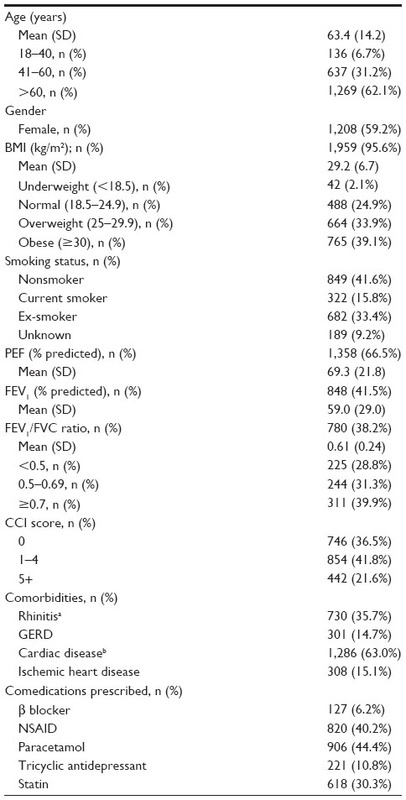 In the patients with baseline lung function data, the mean PEF was 69% of predicted normal, the mean FEV1 was 59% of predicted normal, and the mean FEV1/FVC ratio was 0.61; only 40% of the patients with FEV1 and FVC data had a ratio ≥0.7. Notes: n=2,042, unless otherwise noted; apercentage of patients with data for that variable; bat least one asthma-related hospital visit during baseline year (categorized). Abbreviations: A&E, Accident and Emergency Department; BMI, body mass index; FEV1, forced expiratory volume in one second, expressed as percentage of predicted normal; FVC, forced vital capacity; ICS, inhaled corticosteroid; IQR, interquartile range; LABA, long-acting β2 agonist; PEF, peak expiratory flow, expressed as percentage of predicted normal; SD, standard deviation. Notes: n=2,042 unless otherwise noted; amarginal homogeneity test, unless otherwise noted; bMcNemar test; cpaired t-test; dpercentage of 353 patients with paired FEV1/FVC ratio data; ein salbutamol (albuterol) equivalents; fWilcoxon signed-rank test. Abbreviations: FEV1, forced expiratory volume in one second, expressed as percentage of predicted normal; FVC, forced vital capacity; IQR, interquartile range; OCS, oral corticosteroid; PEF, peak expiratory flow, expressed as percentage of predicted normal; SABA, short-acting β2 agonist; SD, standard deviation. At baseline, most patients were being treated according to British Thoracic Society guidelines19 step 3 (21.5%) or step 4 (49.5%; Table S5). An ICS was prescribed in 83% of patients and a LABA in 68% of patients; 67% were prescribed both (Table S5). Median adherence to ICS therapy (Table S1) was 100%, with 51% of patients having ≥100% adherence (Table S5). 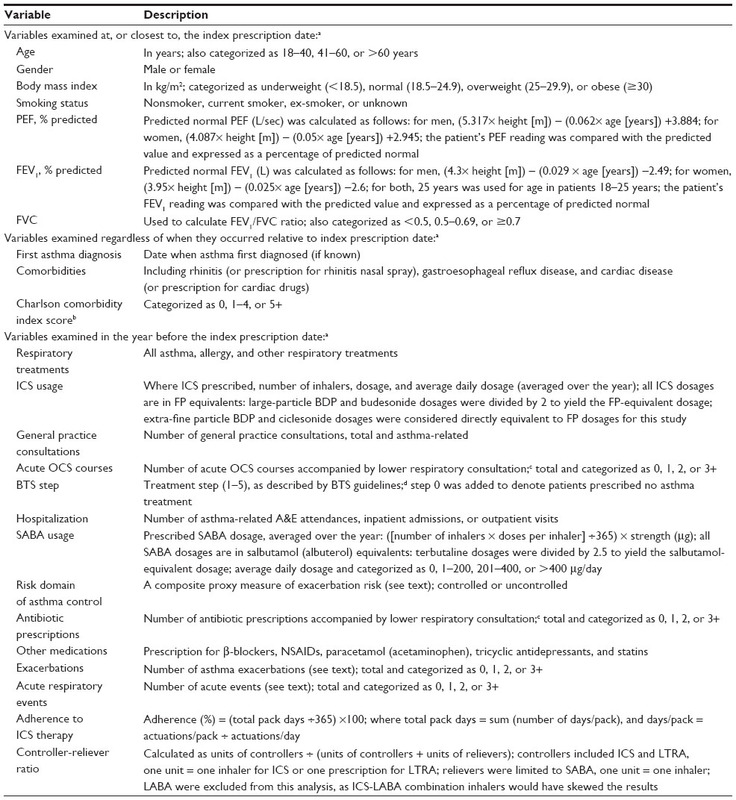 The median controller-reliever ratio (Table S1) was 0.5, indicating approximately equal use of controller (ICS or leukotriene receptor antagonist) and reliever (SABA) medications, although 59% of patients had a ratio ≥0.5 (Table S5), indicating relatively more controller than reliever use. During their baseline year, 37% of patients had at least one exacerbation, 58% had at least one acute respiratory event, and 41% achieved asthma control in the risk domain (Table 3). Comparisons between baseline and outcome years for the various effectiveness measures are summarized in Table 3 and illustrated in Figures 2–4, with further details provided in Table S6. 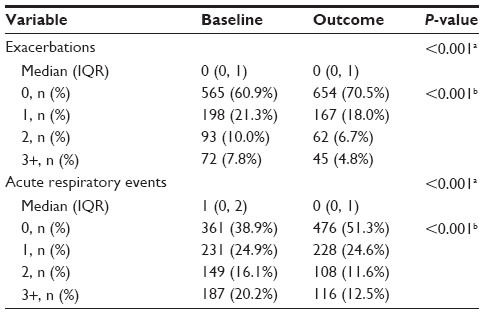 Addition of tiotropium was associated with significantly fewer exacerbations (Figure 2) and acute respiratory events (Figure 3); 27% of patients had at least one exacerbation, 47% had at least one acute respiratory event, and 52% achieved asthma control in the risk domain during the outcome year (Table 3). In addition, tiotropium use was associated with significantly less asthma-related acute OCS and antibiotic use (Tables 3 and S6). 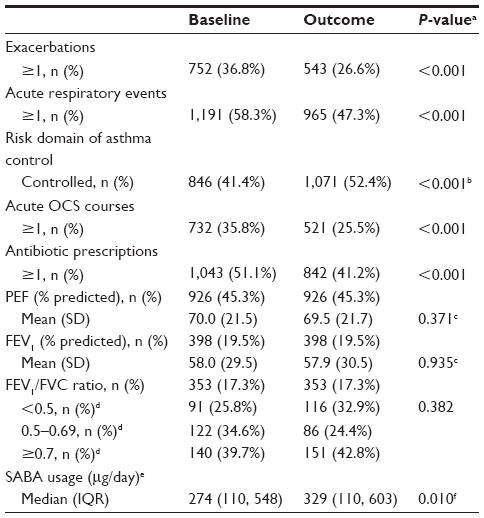 Comparing baseline and outcome years, SABA usage significantly increased (Figure 4), but there were no significant changes in PEF, FEV1, or FEV1/FVC ratio in the patients with paired baseline and outcome data for those variables (Table 3). Figure 2 Exacerbation rates before (baseline) and after (outcome) addition of tiotropium. P,0.001 (marginal homogeneity test) comparing baseline and outcome years. Figure 3 Acute respiratory events before (baseline) and after (outcome) addition of tiotropium. P,0.001 (marginal homogeneity test) comparing baseline and outcome years. Figure 4 SABA usage before (baseline) and after (outcome) addition of tiotropium. Dosages are in salbutamol (albuterol) equivalents; P=0.006 (marginal homogeneity test) comparing baseline and outcome years. Abbreviation: SABA, short-acting β2 agonist. The sensitivity analysis was conducted on 928 patients (45% of the full study group) with the least likelihood of also having COPD. 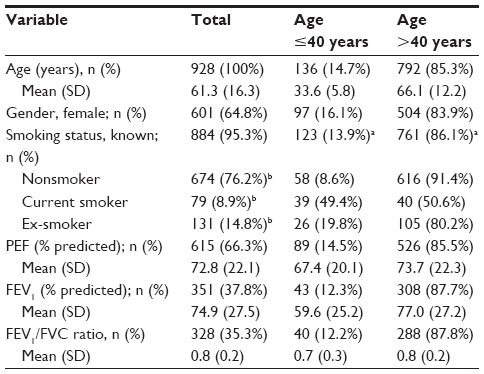 Baseline characteristics are summarized in Table 4, distributed by age group (≤40 and >40 years). Compared with the full study group, proportionately more patients in this subset were female (65%) and nonsmokers (76%), and fewer were current (9%) or former (15%) smokers. The mean FEV1/FVC ratio was 0.8. The rates of exacerbations and acute respiratory events during the baseline year were comparable with those of the full study group, and the addition of tiotropium was associated with a similar decrease in exacerbations and acute respiratory events during the outcome year (Tables 5 and S7). Notes: aWithin-row percentages for the two age groups represent percentage of the total number of patients in that row; bpercentage of 884 patients whose smoking status was known. Abbreviations: FEV1, forced expiratory volume in one second, expressed as percentage of predicted normal; FVC, forced vital capacity; PEF, peak expiratory flow, expressed as percentage of predicted normal; SD, standard deviation. Notes: n=928; amarginal homogeneity test. Our study showed that primary care physicians in the UK have been prescribing LAMA for the treatment of asthma since 2002, even though there were no UK license or guideline recommendations for LAMA use in patients with asthma until September 2014.15 It was not possible with our study design to determine why a LAMA was prescribed in these patients. 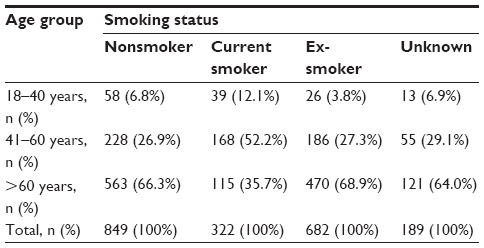 However, 93% of the patients were over 40 years of age and 62% were over 60 years of age, more than 50% of whom were current or former smokers (Table S3). 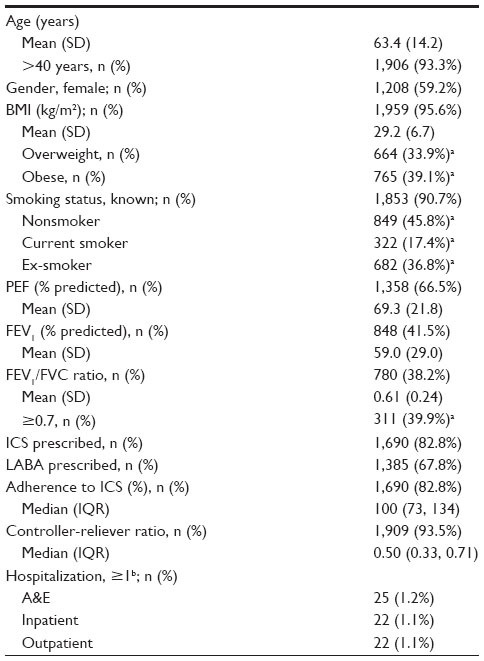 Most had significant comorbidities (Table S2), and many had impairments of lung function and asthma control in the risk domain despite treatment with moderate to high doses of ICS ± LABA, ≥100% adherence to their ICS prescriptions, and controller-reliever ratios indicative of equal or greater use of controller medications throughout the year. Thus, it appears that physicians were prescribing LAMA predominantly as add-on therapy in older patients with poorly controlled asthma despite good treatment compliance, particularly in those who were current or former smokers. Given our study design, it may be argued that regression toward the mean could have contributed to the differences found between baseline and outcome years. This issue may have been obviated by using a matched control group not prescribed tiotropium, although such an approach would almost certainly have led to the loss of unmatched but otherwise qualified patients prescribed tiotropium and thus to a smaller number and perhaps less diverse group of patients for study. As it was, our study design involved data collected over 2 consecutive years within a continuum of ongoing therapy in long-term asthma patients that, for the group, spanned over a decade (2001–2013); and with the exception of the lung function indices, the baseline and outcome values each represented a full year of data, not repeated measures of single, isolated points in time. Thus, if regression toward the mean was a factor in our study results, its influence was likely small. Furthermore, our findings are supported by those of Kerstjens et al,3 who showed in two replicate, randomized, double-blind, placebo-controlled, parallel-group clinical trials involving 48-week study periods and 912 patients in 15 countries that addition of tiotropium significantly increased the time to first exacerbation and decreased the exacerbation risk in patients whose asthma was poorly controlled despite maintenance treatment with ICS and LABA. A legitimate concern, given our study design and patient demographics, is that the group may have included some asthma patients who also had undiagnosed or unrecorded COPD. The sensitivity analysis, limited to the patients least likely to have COPD, was conducted to address this issue. In this subset, addition of tiotropium was associated with decreases in the incidence of exacerbations and other acute respiratory events (specifically, antibiotic prescriptions for lower respiratory tract infection) similar to that found in the full study group. Thus, it is reasonable to conclude that LAMA therapy may be associated with a decrease in asthma exacerbations whether or not the patient may also have COPD. Yet another potential shortcoming of our study design is that not all study patients had lung function data, and in those who did, no constraints could be placed on the timing of the lung function tests with regard to time of day (morning or evening) or bronchodilator administration (before or after bronchodilation), when the tests were performed in the outcome year relative to initiation of tiotropium therapy, nor on quality control of the measurements. In comparison, licensing studies require centralized spirometry over-reading to ensure high quality spirometry. In order to maximize patient numbers, we elected not to limit the study group to only those patients with paired lung function data. Physicians evidently were prescribing LAMA for patients with asthma even in the absence of lung function tests, so our full study group reflects recent clinical practices and outcomes. Between baseline and outcome years, the change in SABA usage in our study group, while statistically significant, was small and may be considered of little clinical relevance. This finding is consistent with RCT results for tiotropium use in patients with asthma,2,3,10,13 but it is somewhat at odds with the classification of tiotropium as a long-acting bronchodilator that is administered once daily,8,15 and with the proposed mechanisms by which LAMA may improve asthma control.1 A longer investigation period may be required to determine whether or not LAMA perform in practice as these mechanisms propose. In the meantime, it is useful to know that addition of tiotropium to the current treatment regimen may reduce the asthma patient’s exacerbation risk within the first year of treatment. In this real-life population of adults with asthma treated in routine clinical practice, addition of a LAMA to the current treatment regimen was associated with a decrease in exacerbations and other acute respiratory events (specifically, antibiotic prescriptions for lower respiratory tract infections) in the following year. This study was funded solely by Research in Real-Life, Cambridge, UK. DP: board membership with Aerocrine, Almirall, Amgen, AstraZeneca, Boehringer Ingelheim, Chiesi, Meda, Mundipharma, Napp, Novartis, and Teva; consultancy with Almirall, Amgen, AstraZeneca, Boehringer Ingelheim, Chiesi, GlaxoSmithKline, Meda, Mundipharma, Napp, Novartis, Pfizer, and Teva; grants/pending grants with UK National Health Service, British Lung Foundation, Aerocrine, AstraZeneca, Boehringer Ingelheim, Chiesi, Eli Lilly, GlaxoSmithKline, Meda, Merck, Mundipharma, Novartis, Orion, Pfizer, Respiratory Effectiveness Group, Takeda, Teva, and Zentiva; payments for lectures/speaking engagements from Almirall, AstraZeneca, Boehringer Ingelheim, Chiesi, Cipla, GlaxoSmithKline, Kyorin, Meda, Merck, Mundipharma, Novartis, Pfizer, SkyePharma, Takeda, and Teva; payment for manuscript preparation from Mundipharma and Teva; patents (planned, pending, or issued) with AKL Ltd; payment for the development of educational materials for GlaxoSmithKline and Novartis; stock/stock options in AKL Ltd (shares) and in Research in Real Life Ltd (RiRL; 80% ownership) and its subsidiary social enterprise Optimum Patient Care; payment for travel/accommodation/meeting expenses from Aerocrine, Boehringer Ingelheim, Mundipharma, Napp, Novartis, and Teva; funding for patient enrollment or completion of research from Almirall, Chiesi, Teva, and Zentiva; peer reviewer for grant committees with Efficacy and Mechanism Evaluation program (2012), HTA (2014), and Medical Research Council (2014); and unrestricted funding for investigator-initiated studies from Aerocrine, AKL Ltd, Almirall, Boehringer Ingelheim, Chiesi, Meda, Mundipharma, Napp, Novartis, Orion, Takeda, Teva, and Zentiva. AK: Neither he nor any member of his close family has any shares in pharmaceutical companies. In the last 3 years he has received speaker’s honoraria for speaking at sponsored meetings or satellite symposia at conferences from the following companies marketing respiratory and allergy products: Aerocrine, AstraZeneca, Boehringer Ingelheim, GlaxoSmithKline, Griffols, Johnson & Johnson, Merck Sharp and Dohme, Novartis, Pfizer, Purdue, and Takeda. He has received honoraria for attending advisory panels from Aerocrine, AstraZeneca, Boehringer Ingelheim, GlaxoSmithKline, Novartis, and Takeda. He has received sponsorship to attend international scientific meetings from AstraZeneca and Pfizer. RJ: In the last 3 years he has received speaker fees, travel expenses, or consultancy fees from Almirall, AstraZeneca, Boehringer Ingelheim, Chiesi, GlaxoSmithKline, Health Intelligence, Napp, Novartis, and Pfizer, and has undertaken research funded by Novartis. DF: She has no shares in pharmaceutical companies. She has received speaker’s honoraria for speaking at sponsored meetings from the following companies marketing respiratory products: Almirall, AstraZeneca, Boehringer Ingelheim, GlaxoSmithKline, Meda, Napp, and Teva. She has received honoraria for advisory panels from Almirall and financial support for conference attendance from Almirall, Napp, and Teva. MT: Neither he nor any member of his close family has any shares in pharmaceutical companies. In the last 3 years he has received speaker’s honoraria for speaking at sponsored meetings or satellite symposia at conferences from the following companies marketing respiratory and allergy products: Aerocrine, AstraZeneca, Boehringer Ingelheim, GlaxoSmithKline, Merck Sharp and Dohme, and Teva. He has received honoraria for attending advisory panels from Aerocrine, Almirall, AstraZeneca, Boehringer Ingelheim, Chiesi, GlaxoSmithKline, Merck Sharp and Dohme, and Novartis. He has received sponsorship to attend international scientific meetings from AstraZeneca, GlaxoSmithKline, and Mundipharma. He has received funding for research projects from Almirall and GlaxoSmithKline. He is chief medical adviser to the charity Asthma UK and a member of the British Thoracic Society SIGN Asthma guideline group and the National Institute for Health and Care Excellence asthma guideline group. AB, SG, JvZ, and MA are employees of RiRL, which has conducted paid research in respiratory disease on behalf of the following organizations in the past 5 years: Aerocrine, AKL Ltd, Almirall, Boehringer Ingelheim, Chiesi, GlaxoSmithKline, Meda, Mundipharma, Napp, Novartis, Orion, Takeda, Teva, and Zentiva. CK declares that she has no conflicts of interest in relation to this study. Kerstjens HA, Disse B, Schröder-Babo W, et al. Tiotropium improves lung function in patients with severe uncontrolled asthma: a randomized controlled trial. J Allergy Clin Immunol. 2011;128:308–314. Kerstjens HA, Engel M, Dahl R, et al. Tiotropium in asthma poorly controlled with standard combination therapy. N Engl J Med. 2012;367: 1198–1207. Wilson J, Bateman ED, Pavord I, Lloyd A, Krivasi T, Esser D. Cost effectiveness of tiotropium in patients with asthma poorly controlled on inhaled glucocorticosteroids and long-acting β-agonists. Appl Health Econ Health Policy. 2014;12:447–459. Kapoor AS, Olsen SR, O’Hara C, Puttagunta L, Vethanayagam D. The efficacy of tiotropium as a steroid-sparing agent in severe asthma. Can Respir J. 2009;16:99–101. Adams KS, Lowe DK. Tiotropium for adults with inadequately controlled persistent asthma. Ann Pharmacother. 2013;47:117–123. Summary of Product Characteristics. Spiriva Respimat 2.5 micrograms solution for inhalation. Electronic Medicines Compendium. Available from: http://www.medicines.org.uk/emc/medicine/20134. Accessed October 13, 2014. Fardon T, Haggart K, Lee DK, Lipworth BJ. A proof of concept study to evaluate stepping down the dose of fluticasone in combination with salmeterol and tiotropium in severe persistent asthma. Respir Med. 2007;101:1218–1228. Bateman ED, Kornmann O, Schmidt P, Pivovarova A, Engel M, Fabbri LM. Tiotropium is noninferior to salmeterol in maintaining improved lung function in B16-Arg/Arg patients with asthma. J Allergy Clin Immunol. 2011;128:315–322. Beeh KM, Moroni-Zentgraf P, Ablinger O, et al. Tiotropium Respimat® in asthma: a double-blind, randomised, dose-ranging study in adult asthma patients with moderate asthma. Respir Res. 2014;15:61. Vogelberg C, Engel M, Moroni-Zentgraf P, et al. Tiotropium in asthmatic adolescents symptomatic despite inhaled corticosteroids: a randomised dose-ranging study. Respir Med. 2014;108:1268–1276. Peters SP, Kunselman SJ, Icitovic N, et al. Tiotropium bromide step-up therapy for adults with uncontrolled asthma. N Engl J Med. 2010;363:1715–1726. Roche N, Reddel HK, Agusti A, et al. Integrating real-life studies in the global therapeutic research framework. Lancet Respir Med. 2013;1:e29–e30. Summary of Product Characteristics. Spiriva 18 microgram inhalation powder. Electronic Medicines Compendium. Available from: http://www.medicines.org.uk/emc/medicine/10039. Accessed October 13, 2014. Hohlfeld JM, Sharma A, van Noord JA, et al. Pharmacokinetics and pharmacodynamics of tiotropium solution and tiotropium powder in chronic obstructive pulmonary disease. J Clin Pharmacol. 2014;54: 405–414. Mathioudakis AG, Chatzimavridou-Grigoriadou V, Evangelopoulou E, Mathioudakis GA, Siafakas NM. Comparative mortality risk of tiotropium administered via Handihaler or Respimat in COPD patients: are they equivalent? Pulm Pharmacol Ther. 2014;28:91–97. Reddel HK, Taylor DR, Bateman ED, et al. An official American Thoracic Society/European Respiratory Society statement: asthma control and exacerbations. Am J Respir Crit Care Med. 2009;180: 59–59. British Thoracic Society. SIGN 141. British guideline on the management of asthma. London, UK: 2014. Available from: https://www.brit-thoracic.org.uk/document-library/clinical-information/asthma/btssign-asthma-guideline-2014/. Accessed October 13, 2014. Sims EJ, Price D, Haughney J, Ryan D, Thomas M. Current control and future risk in asthma management. Allergy Asthma Immunol Res. 2011;3:217–225. Notes: aDate of the patient’s first tiotropium prescription; bAylin P, Bottle A, Jen MH, et al. HSMR mortality indicators. London, UK: Doctor Foster Research; 2010. Available from: http://www.nhs.uk/scorecard/Documents/HSMR%20methodology%2009%20November.pdf. Accessed on March 15, 2013; cany lower respiratory consultation (asthma, COPD, or LRTI code, or lung function/asthma monitoring) with additional respiratory examinations, chest X-rays, and referrals; dBritish Guideline on the Management of Asthma. London, UK: British Thoracic Society; 2014. Available from: https://www.brit-thoracic.org.uk/document-library/clinical-information/asthma/btssign-asthma-guideline-2014/. Abbreviations: A&E, Accident and Emergency Department; BDP, beclomethasone dipropionate; BTS, British Thoracic Society; COPD, chronic obstructive pulmonary disease; FEV1, forced expiratory volume in one second; FP, fluticasone propionate; FVC, forced vital capacity; ICS, inhaled corticosteroid; LABA, long-acting β2 agonist; LTRA, leukotriene receptor antagonist; LRTI, lower respiratory tract infection; NSAIDs, nonsteroidal anti-inflammatory drugs; OCS, oral corticosteroid; PEF, peak expiratory flow; SABA, short-acting β2 agonist. Notes: n=2,042, unless otherwise noted; adiagnosis at any time or nasal spray prescribed during baseline or outcome year; bdiagnosis or cardiac drugs prescribed at any time. Abbreviations: BMI, body mass index; CCI, Charlson Comorbidity Index; FEV1, forced expiratory volume in one second, expressed as percentage of predicted normal; FVC, forced vital capacity; GERD, gastroesophageal reflux disease; NSAID, nonsteroidal anti-inflammatory drug; PEF, peak expiratory flow, expressed as percentage of predicted normal; SD, standard deviation. Abbreviations: FEV1, forced expiratory volume in one second, expressed as percentage of predicted normal; FVC, forced vital capacity. Notes: n=2,042, unless otherwise noted; anonspecialist primary care consultations where asthma was recorded; bprescribed ICS dosage, averaged over the baseline year; cin fluticasone-propionate equivalents; ddosage prescribed at most recent consultation before IPD; eat least one asthma-related hospital visit during baseline year (categorized). Abbreviations: A&E, Accident and Emergency Department; BTS, British Thoracic Society; ICS, inhaled corticosteroid; IPD, index prescription date (date of first tiotropium script); IQR, interquartile range; LABA, long-acting β2 agonist; LTRA, leukotriene receptor antagonist; SAAC, short-acting anticholinergic; SABA, short-acting β2 agonist. Notes: n=2,042, unless otherwise noted; aWilcoxon signed-rank test; bmarginal homogeneity test; cMcNemar test; dpaired t-test; ein salbutamol (albuterol) equivalents. Notes: n=928; aWilcoxon signed-rank test; bmarginal homogeneity test. Aylin P, Bottle A, Jen MH, Middleton S. HSMR mortality indicators. London; UK. Doctor Foster Research; 2010. Available from: http://www.nhs.uk/scorecard/Documents/HSMR%20methodology%2009%20November.pdf. Accessed March 15, 2014. British Guideline on the Management of Asthma. London; UK. British Thoracic Society; 2014. Available from: https://www.brit-thoracic.org.uk/document-library/clinical-information/asthma/btssign-asthma-guideline-2014/. Accessed October 13, 2014.